You can wear more than just your heart on your sleeve. How about a raccoon or a bear or even a fox? 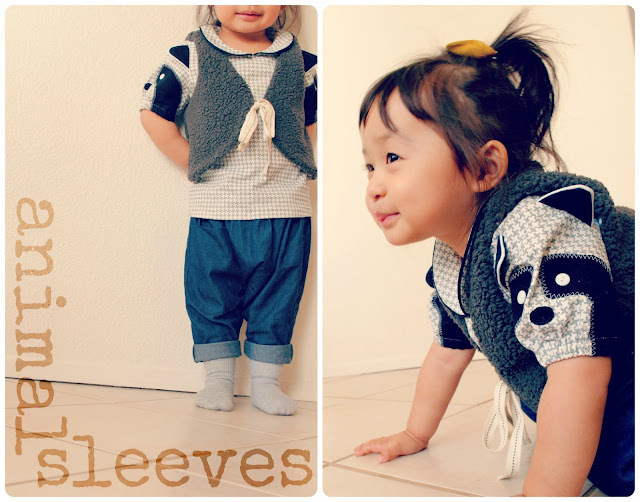 I was inspired by Jennifer of Parrish Platz who made a panda sleeve shirt for her little one. Check it out over here. The hardest part of the creating process was figuring out an animal. I remember Rachael from Imagine Gnats did a series called, "Raccoons The New Black". It was really cute. So I thought I'd give it a go. Since the raccoon was going to be on the sleeve I didn't want to have too many layers as it might be too stiff for movement and comfort. First, I cut the sleeves out and marked the centers to help with placement of the faces. Then I cut out pieces for the face using black flannel with fusible web on the backside. Next, I placed the eye detail and nose onto the sleeve and ironed it. Once it was fused, I did a decorative zig-zag stitch along the edge of the nose and around the eyes. The eyes are buttons and the ears are black flannel with white piping that was sewn into the seams. Quite a few steps, but it came together fairly easy. The blouse is a pattern I have used before (seen here) from this book. 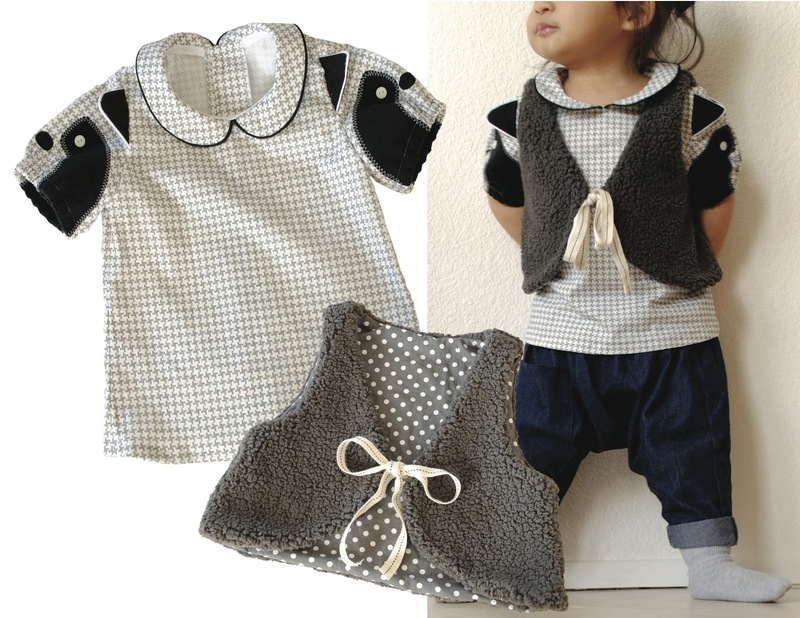 The vest is a pattern from Cucito Babies And Toddlers Magazine, 2011 Winter and Early Spring volume. I tried to locate it for you if you were interested in purchasing it, but I can't seem to find it anywhere. Sorry. The fabric is this suuuuper yummy sherpa fabric I had bought from Fabricworm last year. I had originally wanted to make a throw blanket, but now that we're getting into warmer weather, I opted for a vest. At least now she can wear her blanket, right? So are you ready for a little animal love? What would you wear on your sleeve? Venus, this is brilliant! I love the design of the raccoon. And those pants... can't wait to read more about them! How fun is the animal sleeves, right? And the pants... soooo easy to make and I've made 6 so far (can't have just one). Thanks An! The other day, I was putting away clothes and I noticed that every single item hanging in Lala's closet is handmade. I.LOVE.IT. I wish the older girls would be the same, but they're not into sewn goods. (?!?!) *sigh* Teenagers! oh my goodness Venus, these are ADORABLE! and Lala's little denim sourels are perfect! I love how fun they are without being over the top. Well done! I didn't want to go too crazy. I'm VERY pleased... thanks Rachel! I can see Bean and even Reece having their own shirts. How cute would that be?! You're killing me with the cuteness! One of those "why didn't I think of that?" Awesome ideas. Love it, Venus! oh. my. cuteness. seriously can not believe! this outfit is amazing!! it is cute, comfortable, and looks like it came out of a darling kids boutique. 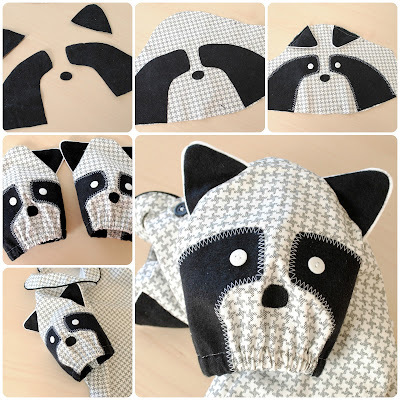 Your work looks very professional from the kids clothes you make to the drawn coffee mugs and the seriously cute owl cookie jar you brightened up. I've seen lots of animal patches on the elbows this season but not the sleeves. This is such a wonderfully creative spin. Love it! Thanks Shannon! Oh the possibilities of what we can make!!! !